I have hardly felt as low as i felt in the days leading to the commencement of my journey to the Middle Kingdom. The mind is a complex being and so is the heart. The combination of these two when they are on a downward trend is formidable and the human being has to really conjure something spectacular to overcome the effects of these two and move the inner being back on a upward trend. For days i fought with this lackasidal approach within me as prepared for the sojourn, the laxity within and the deep sense of melancholy forbade any of the usual enthusiasm and vigour with which i go about preparing for a trip. In the outset the trip itself was thought about in the waning days of the year 2016 while i was drawing out my plan for 2017. Amidst the big sojourns planned somehow few visuals of a Spiti in layer of white nudged me towards slotting this trip somehow. I did spend considerable time though in once again trying to minimise what I was carrying especially on the photographic front and this aspect i feel needs to be ironed out even more, i am still far from happy the way the weight eventually turns out to be. On this instance i minimised my clothing to the barest minimum while at the same time keeping in mind that i was going to go to a place where winter was still ruling and the news channel reports indicated deep snowfall and inclement weather ; cut away all the luxuries and keep only the essentials and not even the desirables. This aspect is still easy but what is the difficult part is the photographic gear? How to reduce weight and what not to carry, it nearly fizzles out my brain each time when i sit down and try to make a list to see what makes the cut and what gets dropped out. One always has the fear that one will not have the correct lens for something magical that comes up and when u start loading the peripherals like the multiple batteries , flash , heavy lenses and tripod , the weight goes up dramatically . This occasion i was taking the Gitzo tripod model for the first time and on it was going to attach the Wimberley gimbal head version II. A superb piece of equipment built to last n perform but the weight definitely stood out. By the time finished packing my backpack stood at 16 kgs including rhe tripod n Wimberley gimbal head which would be weighing around 4 kgs combined. The camera bag containing the lenses would be around 6-7 kgs minimum. I realized that the multiple batteries also have a significant weight factor as do the go pro kit set up. D day arrived and i began my journey in the night as had planned a night travel to cover as much ground as possible and reach into the mountains in the shortest time. Travelling solo lets one push the boundary to known limits thereby helping in accomplishing targets n goals. While i went about the routines of travel at the airport n flight with the calm face , the storm raged inside as i fought to arrest the downward spiral of my inner energy and somehow convert it into an upward positive trajectory. Where was i headed to ??? While my mind’s eye was seeing visuals of snow covered villages in the Spiti and Pin valley, conjuring images of pristine earth decked in white and human settlements far in between. I was looking for an episode of simplicity amidst raw unforgiving beautiful nature and maybe these would be the salve for my bruised within ….. It was to the villages of Sagnam, Rangrik, Langza , Komic and Kibber that i was headed to . To sit in the Key Gompa and maybe vent out my heart and let the cold drain away the mixture within. I do not know why i was going but then it was to these places that i was headed to with the camera gear , letting me indulge in a activity that took my mind off from the remaining aspects that affected my individual being. The journey involves moving to Delhi and then onwards to Shimla and further ahead to the picturesque town of Kalpa in Kinnaur distt, nestled under the gaze of Lord Neelkanth himself. I was to travel on NH 21 the Hindustan Tibet highway graded as one of the most dangerous highways in the world by BRO as well as the BBC. It is this snowed out track that would take me to the villages of Spiti and Pin valley in the days to come or as i hoped circumstances would allow. How will the sojourn shape out, well that time and succeeding paragraphs will decide and convey to readers. Over the preceding year i have been transiting thru Delhi quite regularly as it serves as the gateway for those who are headed north from anywhere else on the sub-continent. I have never felt anything trigger when i m in Delhi. For me nothing jumps within, all i do is wait out the hours for moving ahead and same was the case this time too as i whiled my time waiting for the hour when i could reach Himachal Bhavan and board my Volvo for Shimla. The bus service was professional and timing was respected and no passengers were taken on board in between by the staff which spoke highly of their professionalism. The bus was one of the earliest Volvos in the North, 11 years old to be precise and close to 16 Lacs on the Odo. Truly it had seen life changing on the Delhi Shimla route and i was amazed by the performance of the Volvos once again. The night was passed in satisfactory warmth n comfort and it was still dark when we rolled into Shimla at five in the morning. The town was asleep in the winter morning and i wondered what to do next. At the bus stop I met a young taxi chap who was willing to take me to kalpa as he wanted to earn money from a long distance trip. I realized that he was not very sure of where kalpa is and that i would have to help him in the later part when he drove into unfamiliar terrain. The maruti alto loaded with my stuff we went to the bus stand to have a cup of tea to begin the journey. Rohit, that was his name was quite a talkative guy and spoke at length about Shimla in particular. From his talks i realized that Shimla is quite free n tourist friendly but beneath this layer of bonhomie there is a edge of brute roughness displayed time n again by those who cater to the tourism industry. The competition to earn money from the tourist makes then reckless and overtly aggressive which is displayed amongst each other. The unions play the role of the overlords and it’s a tough aggressive world, totally not what the tourist who comes to Shimla gets an inkling of . In case one wishes to operate a taxi, he has to take apprenticeship for two years driving a taxi of the influential guys who dominate the place. After that he is eligible to get his cab on the roll call list and operate but then again there are a set of unofficial rules to abide by. The caste segregation is still highly prevalent in this region, and marriages are still done within the caste no matter what happens. Other practices of casteism are still practiced. Again i was not aware that this is still done in places like himachal. Money speaks in Shimla, it opens doors and closes objections. The tourism dominated economy is one of the main culprits. So we moved ahead as i listened to his life and the ups n downs that happened. Finally after crossing Narkanda , Rampur , Jeori , Tapri , Karcham i was reaching Kalpa when the clock read 1400 hrs. Most of the hotels were non-functional and the ice hung on the trees and lay in the fields as my shoes crunched over them as i made my way towards a hotel named Apple Pie, recommended by a good friend. The afternoon was spent taking a walk through the ice fields and the lonely path towards Roghi village. I walked halfway and then turned back as the evening was drawing to a close . The next day woke up to the sound of fresh snow flakes waltzing through the air as Kalpa was covered in a layer of white. The entire Kinnaur Kailash range was invisible as the mist covered the mountain range. The clock read seven in the morning, i had a hot cup of tea and then went for a walk in the falling snow to capture some earthly beauty of the Kinnauri landscape in winter. Truly i never imagined that Kalpa could be so pretty n breathtakingly beautiful. The melancholiness within was forgotten as i revelled in the beauty of my existence in such a pristine location. After about an hour of meandering, came back for freshening up and was ready to move onward towards Tabo, in the Spiti valley. The weather was overcast as we made our way in the Scorpio that i had hired to stay with me for the duration of my wanderings. I wanted a powerful rIde considering the unreliable and risky roads ahead with snow being a factor that needed consideration. The route was Kalpa Powari Ribbaa Akpa Moorange Spillow Sasupul Ropa valley Pooh Duling Khab Ka Nako Malling Chango Shalkar Sumdo Hurling Lari Tabo . The route was broken in places as was the case when i had traveled last especially the sections between Powari to Ribba , Shalkar to Sumdo , Ka to Nako , and Sumdo to Hurling. My ride was a Scorpio driven by Mahenderji and it was a easy companion silence punctuated with intermittent conversations. I liked his way of driving too which was careful controlled way and we covered the distance quickly. The entire region is dominated by large number of hydro electric projects which have contributed to the instability of the surrounding mountains which in itself are having porous material. The iconic Khab bridge at the confluence of Sutlej and Spiti stood in mighty solitude in these winter times , my desire to visit Shipki La once again resurfaced as i crossed the diversion and the sign board beckoned me. Shipki La is a high mountain pass at a height of ….. which offers a gateway and an alternate route to Kailash Mansarovar. However, the route has not been opened to the general public and the pass lies at the border of India & Tibet. 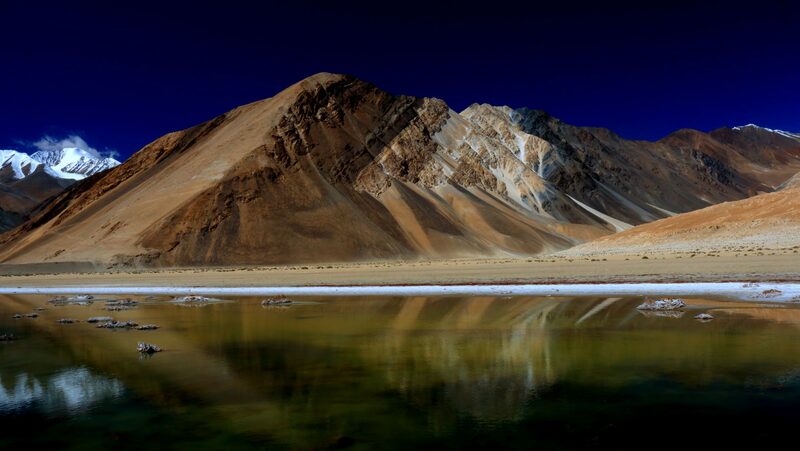 Presently manned by the personnel from ITBP, it is a restricted area and is not accessible for visitors . The pass lay nestled in the higher reaches of the mountains covered with snow and my gaze lingered on it for very long time however i knew that this was still not the moment. Back in 2013, i had realized that it was not feasible to attempt owing to problems with the ride of mine and this time i did not wish to attempt in a taxi on snow covered risky broken roads. Someday i feel will find myself at Shipki La, i knew that in my bones. A few words here about the Hindustan Tibet highway modelled on the old silk route, the highway runs on the mountain ridges higher up from the existing highway on which we were travelling and i could see glimpses of it when the views opened up. The highway deviated from the current route at Tapri and rose dramatically up into the mountains and continued on that elevation eventually reaching Kalpa from where it moved ahead towards Pangi Village and then onwards bypassing places like Ribba , Moorang , Akpa eventually descending a bit near the diversion to Ropa valley and thereafter again rose upwards towards Shipki La .This is a narrow jeep route and is not in use and its historical significance added to its allure . I only wish someday i could travel on this mythical elusive Hindustan Tibet Highway and see the world around with a new perspective that this route offered. We reached Nako by 1200 hrs and i went for a walk through the village towards Nako lake as well as the to the chorten up on the nearby hill. The snow was quite high on the trail up to the chorten and the Tibet Lowa (my latest acquisition boots) performed admirably in the soft snow and melting watery trail. NAKO lake was totally frozen and presented a pretty sight with the village in the background and the snow covered peaks in the backdrop. After a leisurely time spent i started back and soon we were on our way towards Sumdo which was the gateway to Spiti valley. We reached Tabo, our stay by 1600 hrs and the village was surprisingly very neat and emanated positive vibes. The new monastery was under construction and i was told that the same would be inaugurated by his H H Dalai Lama in May 2017. Our stay for the night was at Kesang home stay; a delightful homestay run by a very warm couple by the name Mr Sherab Bodh. The evening was spent sitting in the donkhan as the weather had deteriorated in the night and i engaged in a very lively conversation with Sherab ji on a plethora of topics. From his conversation i could gather that better roads, power and transport connectivity were three major and pressing requirements. A qualified medical doctor who had modern basic medical facilities at his disposal was the next most pressing requirement. Mrs Sherab spoke about a time of her childhood when the entire Spiti region was in deep poverty with hardly any source of development other than self-sustaince. However with the passage of time and opening up of the region, the local populace had adapted new methodology of growing crops including apple gardens as well as tourism trade. This had improved the standard of living of a majority of the people out here. The region is deeply ingrained in the Buddhism culture and till very recently it was the nomr to send the second born son to take up the vow of a monk. However, with the passage of time this practise has somewhat reduced with better avenues opening up and children wanting to experience the material world. the trade with China still happens out here, especially through the route via Kaurik , surup and poorang villages. The barter system was very much prevalent till recent times and still continues however it is mired in beauracracy and red tape. The goods that are procured are either electronic gadgets, crockery, herbal products, clothing for the home etc. The journey is tiring and hazardous both because of the nature as well as men. Dinner was a splendid affair as we ate sumptuous hot tasty dinner cooked homemade style; a perfect closure to a nice day indeed. I slept in three quilts such was cold at night as light flakes of snowfall kept falling through the night. The next day morning i woke up to a splendid sunshine and the entire region was smiling in icy glory. The agenda for the day was to reach Sagnam village in pin valley. The route was manageable and after sichling the amount of ice was immense, i would say that the ice would be around three to four feet average however the road had been opened. Soon we were at the entrance to Lingti valley where there is a small hydroelectric power project which supplies electricity to Lalung , Rama as well as the villages of Pin Valley namely Gulling , Mukim , Sagnam as well as Mudh. There is so much to explore in this region that the traveler is at a loss of which region to proceed into. Someday i would undertake a brief sojourn into the Lingti valley too which generally is on the off beat path for those who travel towards Spiti region. Most of the travelers are focused on reaching Kaza and thereafter seeing the Ki Gompa and few surrounding areas and then transverse ahead towards Kunzum pass while in winters only the most hardy venture into the Spiti and even then hardly think many would even plan to go towards Lingti valley and the villages out there which are submerged in huge amounts of snow. Anyway coming back to the present there were so many photographic locations in the entire Spiti and Lingti valley. The absence of any tourist ensures that the wow factor was paramount. Soon i was at the entrance of Pin valley and the amount of snow was momentous. There was easily above five feet of snow as the road had been cut to just pass a sumo. We moved slowly ahead in brilliant sunshine, the cold was immense but i was ecstatic seeing the desolate raw beauty of the place. Kir nullah including the region prior to it was a major bottleneck as the glaciers on both the sides converged out here and ensured that the entire snow was deposited in this section. We moved ahead with may a time the snow scrapping the doors on both sides. Soon after two kms we reached Gulling. Ahead of Gulling was Mikim and thereafter ahead of it was the left cut to Sagnam, our destination of the day. The same road ahead went to Khar village followed by Ternam and then Telkin and finally culminating at Mudh. However, the main road went ahead to Ka Dogri and then into the national park. Sagnam village consisted of around 500 personnel and around 70 houses., one of the largest villages of the Pin valley. It houses a medical facility in addition to a education facility till std 12th. There is also internet facility and power hence it is affluent. The main occupation is farming and livestock with horses and yak are reared extensively. The maintenance of yak in fact is a major exercise, the animal has a lifespan of 22 yrs and needs to be looked after with special emphasis on feeding thrice a day as well as cutting of hair to cool the body. There are a average of two yaks in every household in addition to asses sheep and horses. Winter in pin valley, in villages like Sagnam is worth seeing with huge amount of snow deposited covering the mud houses itself. In the olden days there used be tremendous hardship faced by those who inhabited these villages especially in the winter when there used to be total cut off from the outside world and the matter of getting provisions stocked up for the winter or getting people who fell sick the opportunity of medical services at the big towns like Shimla or Chandigarh was just not feasible. Today there is the emergency helicopter service which can be used in case of medical emergencies. There are few more villages prior Gulling like Tangti Yoma and Tangti Gogma . On the right we have Bar and also Seiling. These are all small villages that are nestled high up between the mountain ranges hardly touched by the tourist influx. There is a rustic lifestyle in these villages, the houses are made of mud which helps in retaining the heat inside. The kitchen is the epicentre of existence during winters as the entire family generally spends time out there over endless cups of tea whether sweet or salted . There is a changhi which is basically a central heater in which cut wood is burnt and over it hot water is heated continuously for usage. The heat generated by this contraption is sufficient to warm up the entire kitchen which is covered with numerous rugs thereby making a very cosy place to pass the winters . The lifestyle in villages like Sagnam during winters is very relaxed as there is no major activity that is undertaken on account of the excessive snow that is generated . Hence relaxing and conserving body heat and looking after the animals is the only major activity undertaken. The period after the culmination of winters is hectic for the short period is used for growing peas in places like pin valley and apples further lower in Spiti or Baspa valley. Besides this the culmination of winter also marks the arrival of the tourists who visit the Spiti valley in search of nature and its glory thereby providing the local economy with revenue and a supplement to the income which then helps in preparing for the next winter which would be coming ahead. As the dusk fell i spent the evening till post dinner at the home stay kitchen in the company of the hosts participating in a multitude of topics ranging from the performance of the local administration, the elected MLAS and also various incidents that had occurred in this region which are etched in the mind of the local folks like the time when Indira Gandhi the then PM had visited Sagnam and Kaza and had interacted with the local womenfolk including participating in the local dances too. It was quite a refreshing time listening to tales of this region. Tomorrow was going to be a new day and i looked forward to it as we left Pin valley and moved back into Spiti valley towards further villages ahead of Kaza.